Our educational model offers an environment based on the linguistic immersion into the English language in all the educational stages from Infants to Baccalaureate, following the framework set by the Department of Education of the Generalitat de Catalunya. Our education focuses on the child as the centre of their own learning and we offer personalized attention for the individual by attending to their needs and using multi level programmes. The school atmosphere, working with projects, encouraging entrepreneurship and creativity skills, along with the introduction to cross-curricular technology programmes, allow our pupils to prepare for the demands and high levels necessary for university and the society we live in. 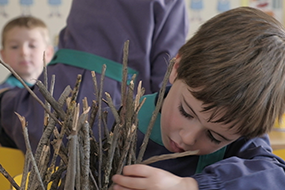 The integral education of the pupil in all areas of personal and academic development. A plurilingual education . All our pupils learn the following languages: English, Catalan, Spanish, and French. The emotional development of the pupil, where personal guidelines are adopted in order to work alongside the family. A permanent team of psychologists and a speech therapist who offer personalized attention. Our Orientation and Diagnostic department has also developed a programme catering for the more gifted children. The development of good working habits to stimulate effort and aid the acquisition of skills and strategies. The pupils being treated as participants in learning and the teachers as mediators and guides in the acquisition of knowledge. A methodology which encourages teamwork, autonomy, a sense of responsibility and personal strength. A system of values geared towards the development of pupils with initiative, respect for rights and basic freedom which prepares them to actively and critically participate in both social and cultural aspects of life. The stimulation of different artistic, musical and sporting abilities together with cross curricular and complementary areas of education in order to furnish them with the necessary skills to adopt a healthy lifestyle which is culturally enriching. 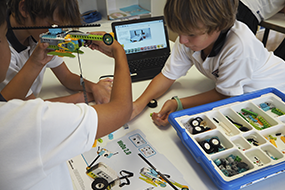 Projects from Primary to Baccalaureate which involve Programming, Robotics and STEAM which are integrated into our educational system. An aim to stimulate our pupils in a creative, global world. Various projects are undertaken to foster abilities such as Entrepreneurship and Intellectual Creativity. Encouraging a healthy educational atmosphere and aiming to provide a good quality of life. The overall relationship between our pupils and adults is constructive, creating a productive bond between students and teachers. Clarity and fairness is applied when setting rules and our past pupils have developed a very sentimental attachment to the school when they leave. The Psychology Department is formed by two psychologists and a speech therapist who are part of our permanent staff. They tend to the needs of pupils referred to them by family or tutor teachers. They guide and coordinate together with the teachers and establish the diagnostic and detection protocols of pupils of all ages. They attend to the needs of our pupils, helping to discover and develop their intellectual and emotional capacities in order to enable them to reach their maximum potential. The students are evaluated in groups or individually according to age. Ways of helping the pupils are suggested and decided with parents and teachers. Special needs children are attended to academically as soon as their problems are detected. Our pupils are given career guidance for further education. As a school we work and promote values which define our professionalism and which we hope will reach our pupils on an individual level at home. These values give us important guidelines to help us manage the way we work. We understand that the total involvement of the teachers and the whole school in general is fundamental to provide the pupils with the abilities to learn the skills necessary to work and live together employing their own values in a democratic society. Achieving a good atmosphere of togetherness, working on respect, tolerance and equality. Motivating the pupils to become active citizens who take part in learning-projects and in social campaigns involving charity and generosity and to encourage their full involvement in these projects. Favouring different activities to encourage friendship, empathy and conflict resolution.